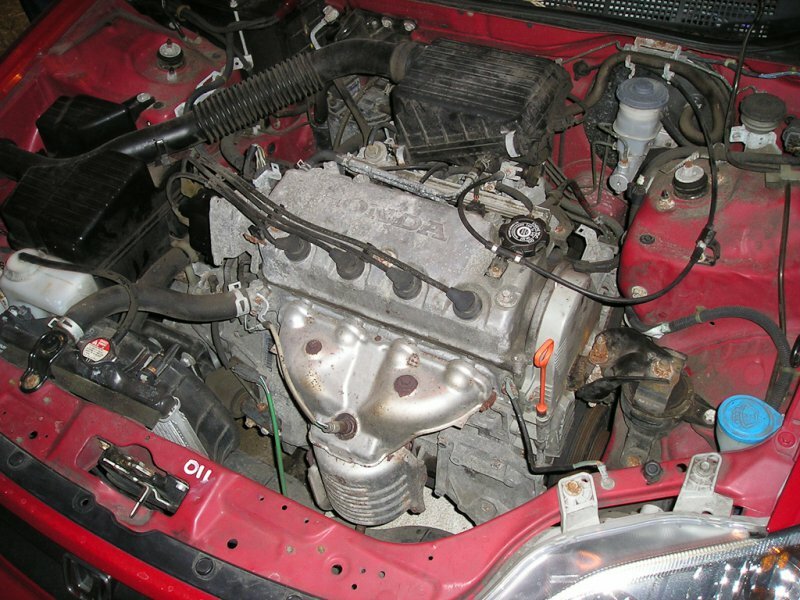 The Honda D16Y7 is a 1.6L, inline 4-cylinder engine that was produced from 1996 to 2000 for use in the Honda Civic and Del Sol. This engine is part of the Honda D series engine family. All Honda engines that start with a “D” have inline-four cylinder configurations with a displacement between 1.2 and 1.7L. The D series began production in 1984 and finally ended in 2005. With over 21 years of experience with this style engine, Honda had plenty of time to work out the problems as they appeared. This is one reason why you can still find these engines on the road today. Unlike some of the more popular Honda engines produced in the 1990’s, this engine did not have dual overhead cams or use VTEC technology. The D16Y7 had only 106 horsepower and was used in the Honda Civic base models. Starting in 1996, the D16Y7 engine replaced the D15B7 which was available from 1992 until 1995. This change meant that beginning in 1996, Honda Civics would have an increased displacement of 1.6L instead of 1.5L. Due to this upgrade the D16Y7 delivered an additional 4 horsepower. It is important to note that due to new emission laws beginning in 1996, all cars manufactured in the United States were required to have the new Onboard Diagnostic (OBD-II) system. The D16Y7 engine was equipped with the first generation OBD-II system, which we still use today. This engine was used in the DX, LX and CX models of the Honda Civic and was not considered a high performance engine. The D16Y7 base model engine had only 106 hp compared to 127 hp in the D16Y8 VTEC which was available in the 1996-2000 Honda Civic EX models. In 2001 the D16Y7 was replaced by the D17A1. Again Honda increased the displacement from 1.6L to 1.7L and improved the overall output to 115 hp. The base model Honda Civic was not marketed as a high performance engine since it only had 106 horsepower and 103 lb-ft of torque. The D16Y7 is not very popular among tuners because it has a single overhead cam and is not equipped with VTEC technology. However, the DX, LX and CX models all had great gas mileage, getting 32 mpg city and 37 mpg highway. In contrast, the high performance Honda Civic EX model only got 30 mpg city and 35 mpg highway. As noted by the “16” in the name of this engine, it had a displacement of 1.6L or 97 cubic inches. The bore is 2.95 inches (75 mm) and the stroke is 3.54 inches (90 mm). Honda set the compression ratio for the D16Y7 engine at 9.4:1. Since Honda had 12 years of experience producing the D series engine before they released the D16Y7, there are very few problems with this engine. In fact, it is not uncommon to find used Civics with this engine that have over 300,000 miles and are still going strong. The block and head are both constructed out of aluminum, making this a lightweight, efficient engine. The head features a single overhead cam with 4 valves per cylinder. By only using a single overhead cam, Honda was able to keep cost and maintenance to a minimum with this engine. The D16Y7 is still a popular engine and can be found in Civics all over the country. However, this engine was greatly overshadowed by the performance found in the Honda VTEC engines of the same time period. That being said, with only 106 horsepower this engine was designed for great gas mileage and durability, not performance. Plus, it was one of the first Honda Civics to be equipped with the new OBD-II emissions control technology and catalytic converters. After the D16Y7 was phased out, Honda increased the size of the engine found in the base model Honda Civics and gave them extra horsepower.